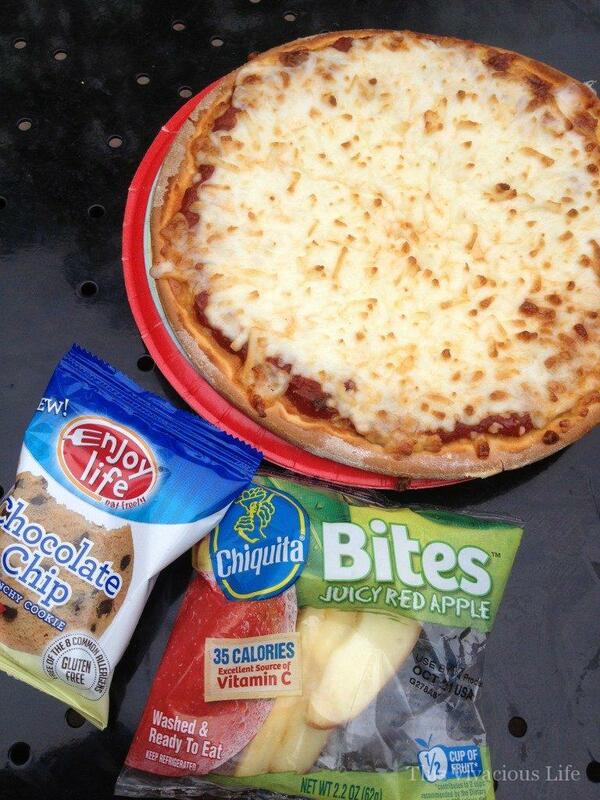 Gluten-free Disneyland food finds that rock! Disneyland & California Adventure was one of the tastiest vacations we have ever been on. 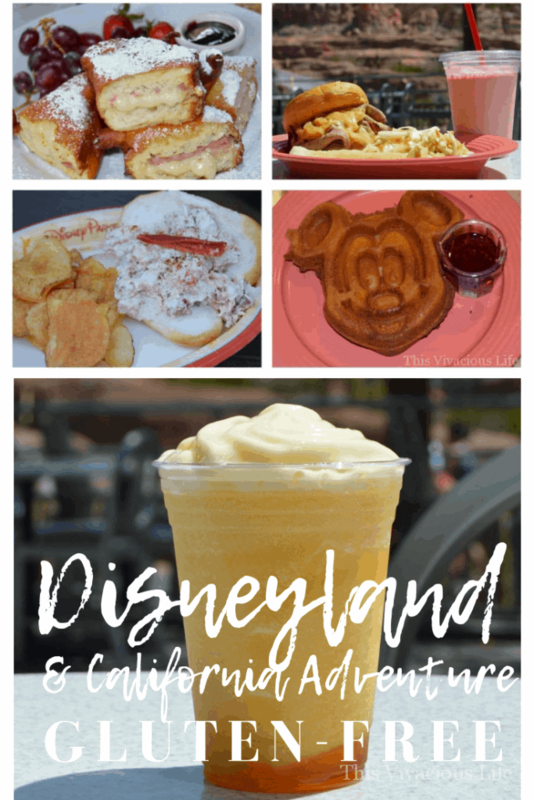 From fancy food to on-the-go eats like gluten-free pizza and monte cristo sandwiches, Disneyland has it all! 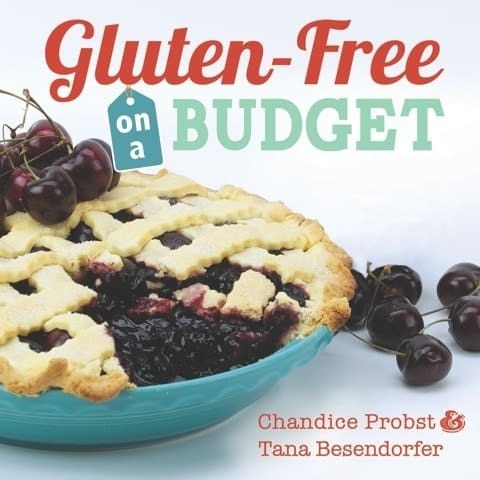 How do I prepare for my gluten-free Disneyland trip? I absolutely love how easy gluten-free Disneyland & California Adventure are. 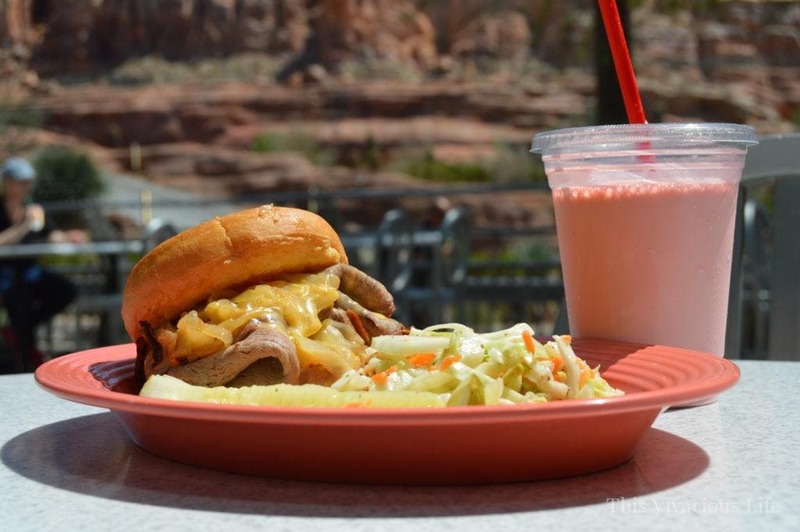 They make it both simple and delicious to eat safely in both parks. 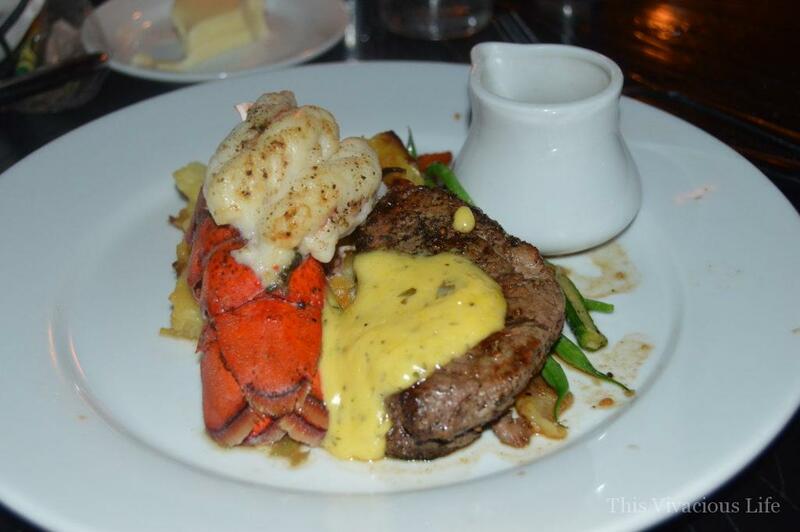 Start by making reservations with specific menu requests at least 72 hours prior to your visit. Also, be sure to stop in to each individual restaurant to get the most up to date list of gluten-free offerings when you are in the park. Pro Tip: Reach out to chefs before your trip (at least 72 hours in advance) with your specific dietary needs. 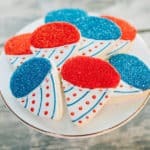 The email they recommend using to connect is DLR.Special.Diets@disney.com. You can also get more information on their website: https://disneyland.disney.go.com/guest-services/special-dietary-requests/. Pro tip: Be sure to make all of your reservations EARLY. You can book up to 60 days in advance for some restaurants and many will book up within the first few days of releasing reservations.You can make dining reservations online or call (714) 781-DINE or (714) 781-3463. Does Disneyland have dairy-free options too? 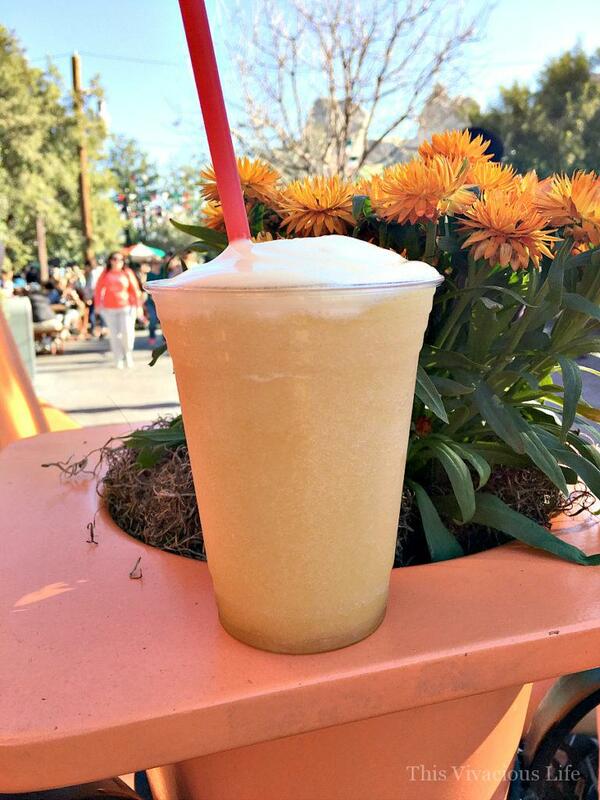 Yes, dairy-free Disneyland is actually quite easy as well. I wrote all about my experience with it first hand. 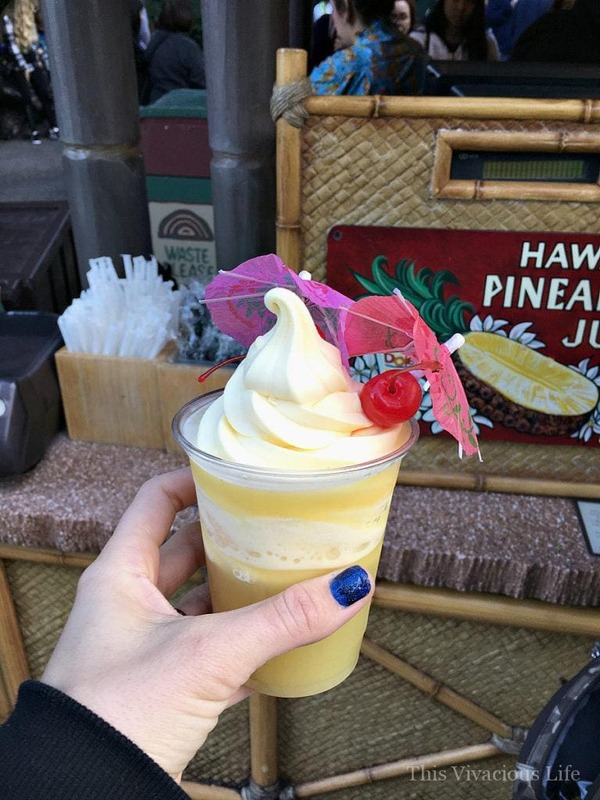 First, this Dole whip is the very freshest treat in the park and it is dairy-free! You can also find lots of fresh fruit stands, turkey legs, Enjoy Life Foods cookies and chocolate bars in the gift shops and so much more. 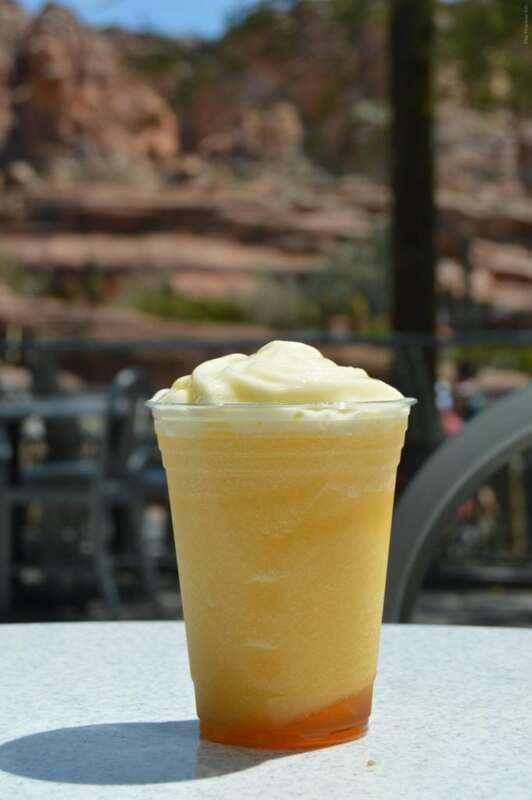 The Red’s Apple Freeze in Cars Land is hands down my favorite treat and it is dairy-free too. 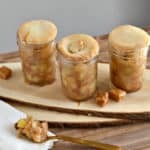 It’s made with 100% frozen apple juice and swirled with marshmallow syrup. It is then topped with a non-dairy passion fruit mango foam. 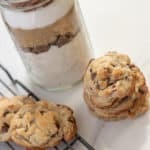 I promise you, this is one that you will want to order over and over again! This meal from Cafe Orleans was most definitely RICH! 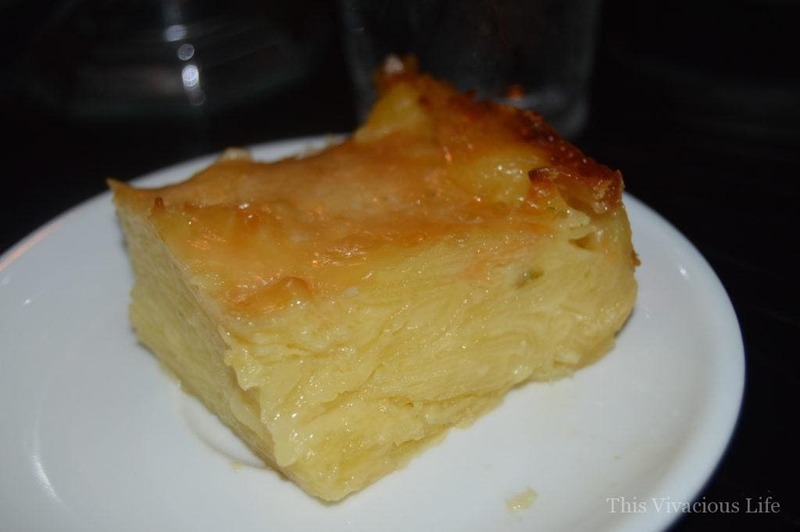 We had emailed ahead of time to see if they might be able to do some of their famous Monte Cristo sandwiches for us gluten-free. 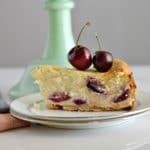 They accommodated by having gluten-free bread (Udi’s) on hand as well as creating a new batter (using Cup4Cup flour) and fresh oil in a new fryer that was dedicated gluten-free for us. The end result was fantastic! In fact, my dad who ordered the regular version said ours was much, MUCH better. He thought it was lighter and more flavorful. Pro Tip: Make sure to call ahead for a reservation for the first of the day when the oil is fresh and not contaminated with gluten. 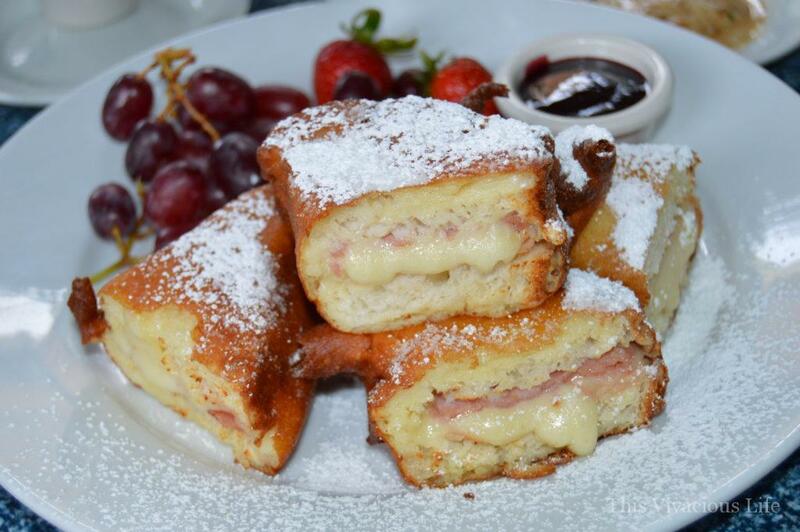 Also, make sure with your reservation that they know you are wanting a Disneyland gluten-free monte cristo sandwich. 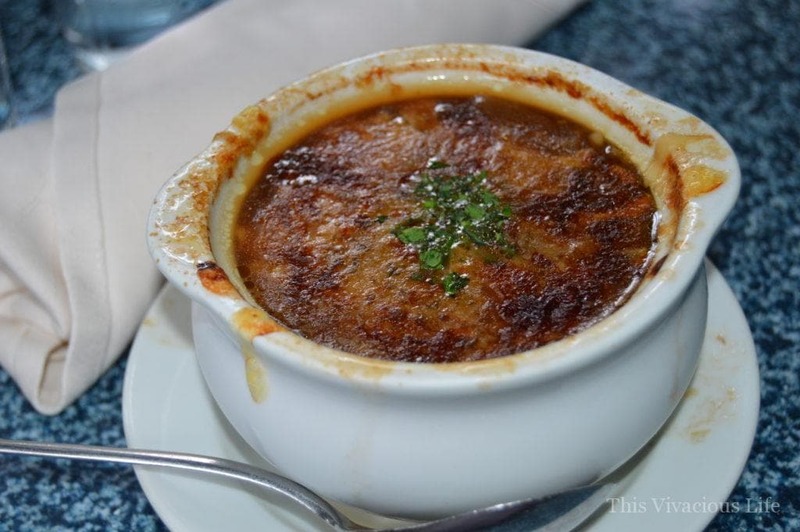 We also enjoyed a hot bowl of gluten-free French onion soup as well! was made special for us and was actually featured on the brand new allergen-free menu. My only suggestion with the soup would be to ask them to do half the cheese unless you REALLY love cheese because it had a lot. Does Disneyland have other gluten-free options? I don’t know about you guys but we love Critter Country over by Splash Mountain. I called ahead and asked if Harbour Galley could make us their famous lobster roll gluten-free. They agreed and WOW, I am thankful they did! The filling is made with real lobster meat and is always gluten-free but they made some special for us. They also had some gluten-free hotdog buns brought over from another location to serve it on as they don’t normally keep them in stock. Pro Tip: With the 2018 menu update Harbour Galley no longer offers gluten-free bread. I recommend just the filling with fresh gluten-free potato chips anyway. When I go back I don’t mind just enjoying the lobster salad with chips. I felt like the bread was just kind of meh compared to the rest of the plate. This was definitely one of my favorite lunches during our Disneyland gluten-free & California Adventure gluten-free trip…YUM! They also made us a fresh batch of potato chips in dedicated gluten-free oil. They were fantastic! What fine dining gluten-free options are there? Definitely! 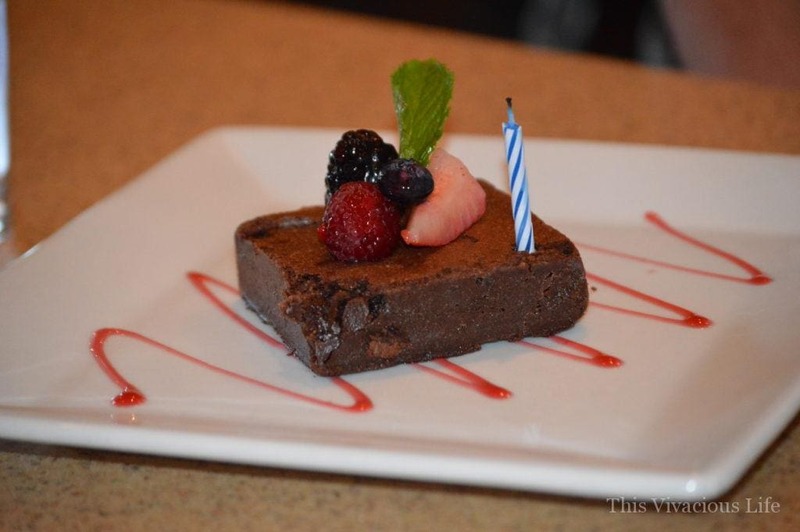 My 30th birthday dinner was celebrated at Wine Country Trattoria in California Adventure. It was fantastic! I don’t know that I have ever seen my mom order pasta at a restaurant let alone eat it anywhere in the past 10 years and she actually loved it! She and I both enjoyed gluten-free pasta dishes, her the shrimp scampi and myself the herb roasted chicken that was served with fettuccine alfredo and broccolini. 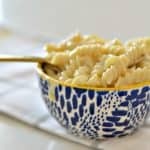 The pasta was cooked to perfection and we could hardly believe it was gluten-free. 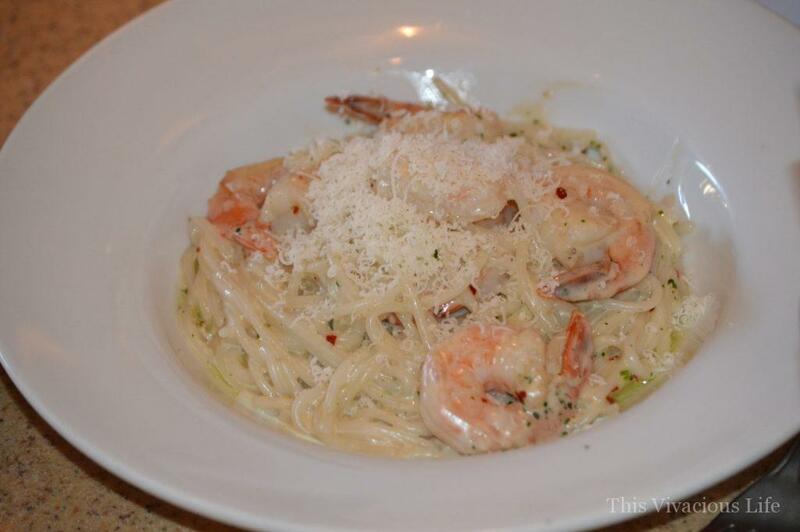 It was definitely one of the best pastas I have ever enjoyed. In addition to our entrees, we were also provided with hot, soft gluten-free rolls that even the gluten eaters were stealing from us. The salads we chose for our appetizers were the caprese and the Italian insalata. Both were very good as well as fresh. The portion was not too small but also not large enough for sharing. Our meal was completed by a surprise presentation of a warm, gooey gluten-free chocolate brownie with fresh berries on top and a berry coulis. What a kind gesture by the restaurant to make my birthday dinner even more magical! As you can see, my husband is quite the comedian. 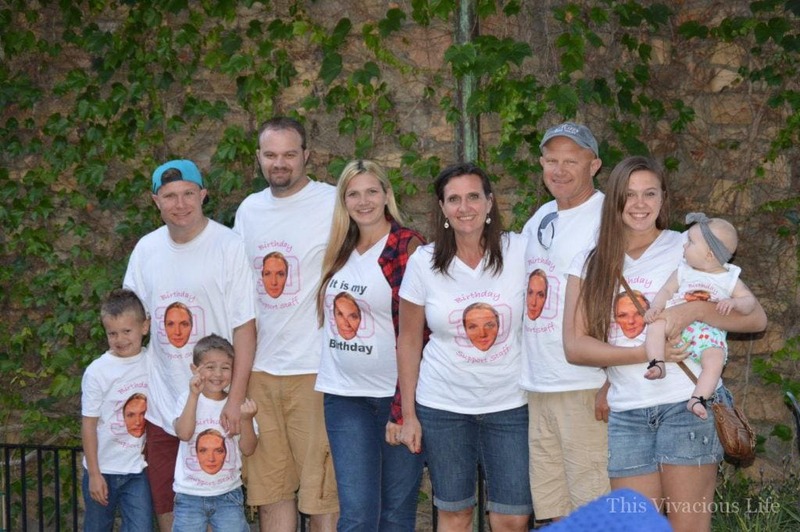 He had these shirts made for everyone including our little kids and new baby that said 30th birthday support staff. 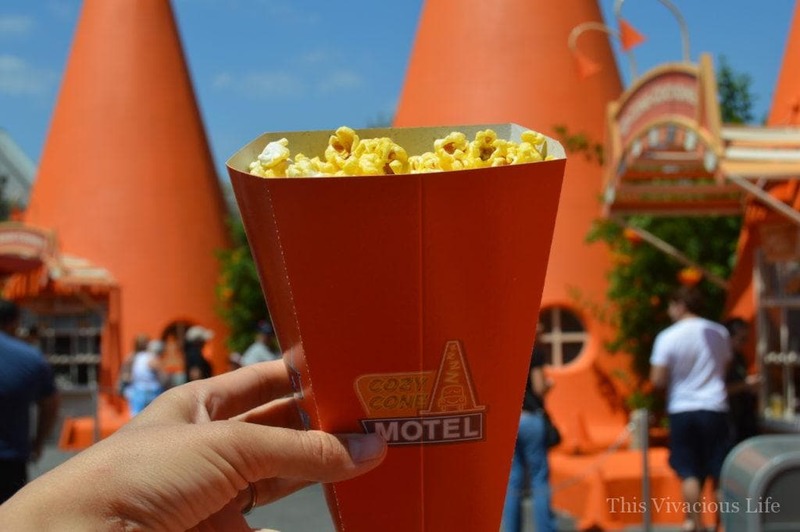 What other amusement parks have gluten-free options? I first wrote about our Disneyland gluten-free experience back in 2005 when it was virtually the only amusement park with good gluten-free food. We also did Disneyworld gluten-free which was fantastic! Now, other have better options. We did Universal Studios & the Wizarding World of Harry Potter gluten-free awhile back. We’ve even done Legoland gluten-free and enjoyed it, but not quite as well. 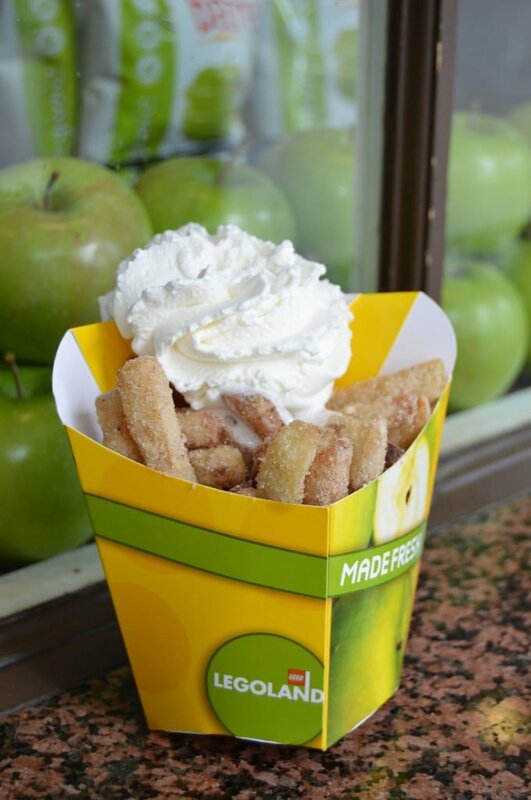 Just be sure to get their apple fries! 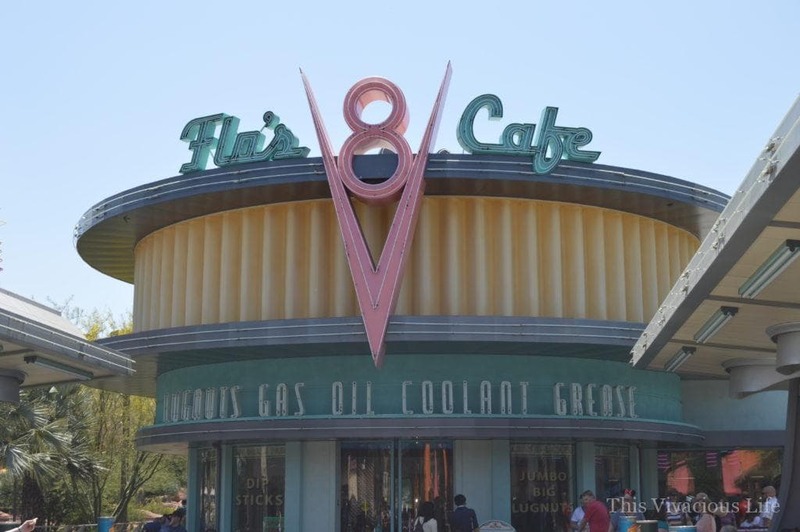 What is gluten-free in Disney’s California Adventure? From the decor to the music, they got it all right. We also LOVED the new Cars ride! There are two different routes on it so make sure you get to enjoy both. The new Cars Land in California Adventure was awesome! I have to say that Disney truly went where nobody has gone before in creating the ultimate movie experience in a theme park. You immedietely feel like you walked into Radiator Springs when you step onto the asphalt. The Cozy Cone Motel features multiple cones that each serve different food and beverage items. While we couldn’t enjoy the famous bread cones filled with chili or mac n’ cheese, my hubby did and said it was good. I enjoyed some buttered popcorn and the highly recommended Red’s Apple Freeze. I hear the popcorn comes in many flavors including bacon cheddar and dill pickle but I opted for the classic. Red’s Apple Freeze was SO good! 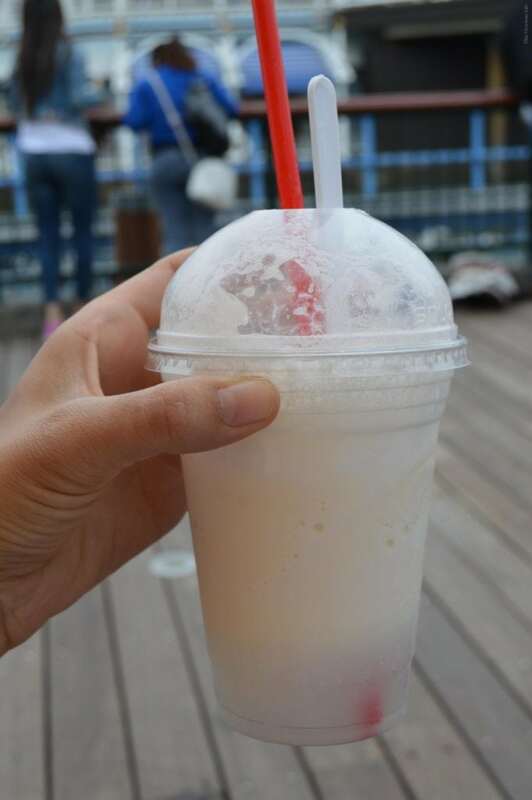 It was apple juice slushified with marshmallow cream and a creamy foam topping. We ended up coming back another time on our trip because we needed just one more. At Flo’s V-8 Cafe we enjoyed the most talked about item on the menu, roast beef & cheddar sandwich with horseradish aioli and grilled onions. It was served with coleslaw and was on a gluten-free bun. I chose to add a strawberry shake on and I am glad I did. It was delicious and simple just like a good shake should be. Who can beat that view right? Disney knocked it out of the park with their new Cars Land. There were a few other things that we tried while visiting the most magical place on Earth. 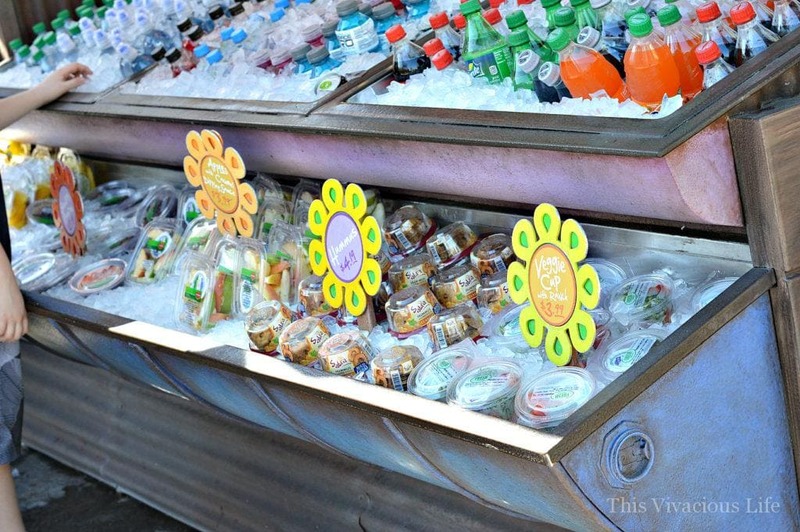 We enjoyed the Sprite float and the Mediterranean plate from Paradise Garden Grill both in California Adventure. Neither knocked my socks off but they were good. The Sprite float is just that, Sprite with ice cream to make it a float. Since I don’t love root beer floats as much, this was a nice, refreshing treat. 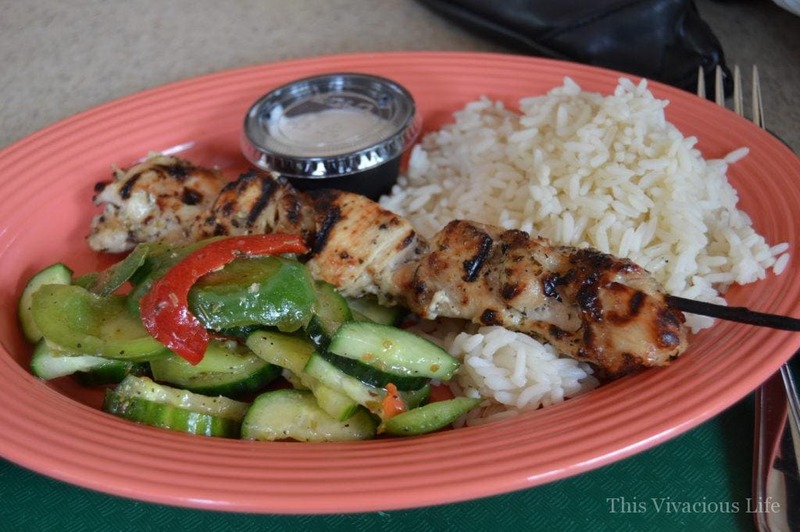 The lemon-oregano chicken skewer was filling especially when served with white rice and a yummy cucumber salad. The tzatziki and moroccan chili chimchurri sauces were great accompaniments. What used to be Taste Pilots in California Adventure next to Soarin’ is now Smokejumpers Grill. 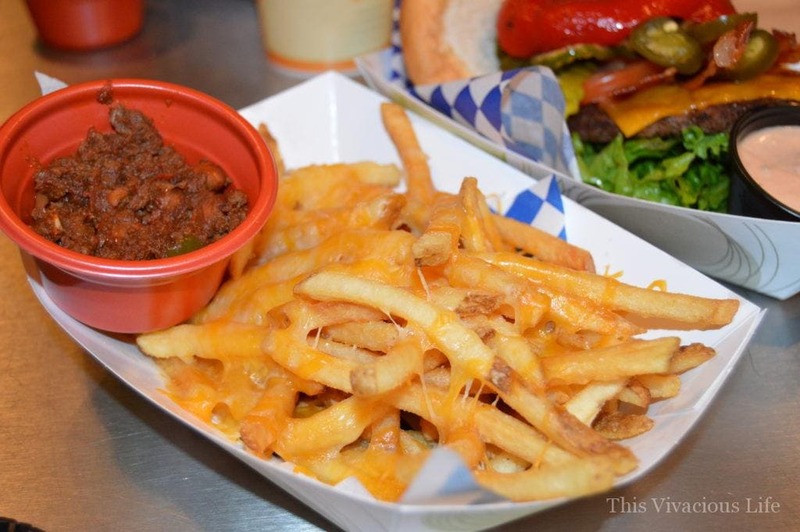 Nearly everything on the menu is gluten-free including the chili for the chili cheese fries! 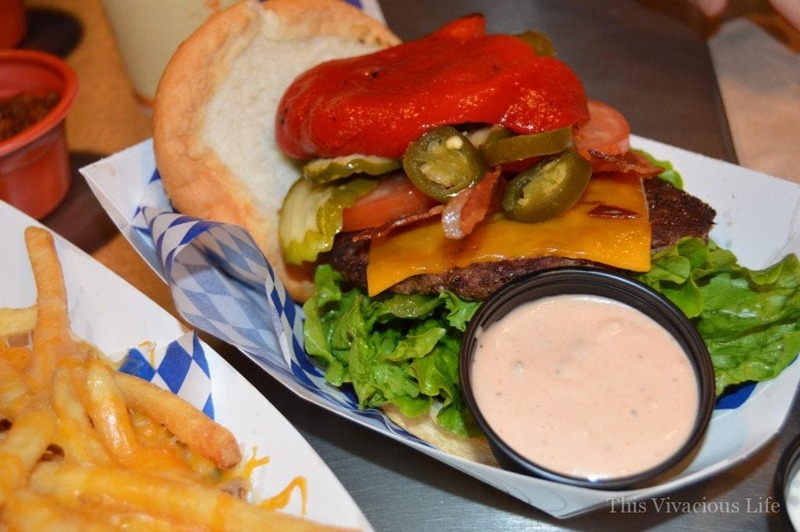 They have a dedicated fryer and lots of great toppings for the burgers. While the meat patty wasn’t huge, it was still filling enough especially once you add toppings. 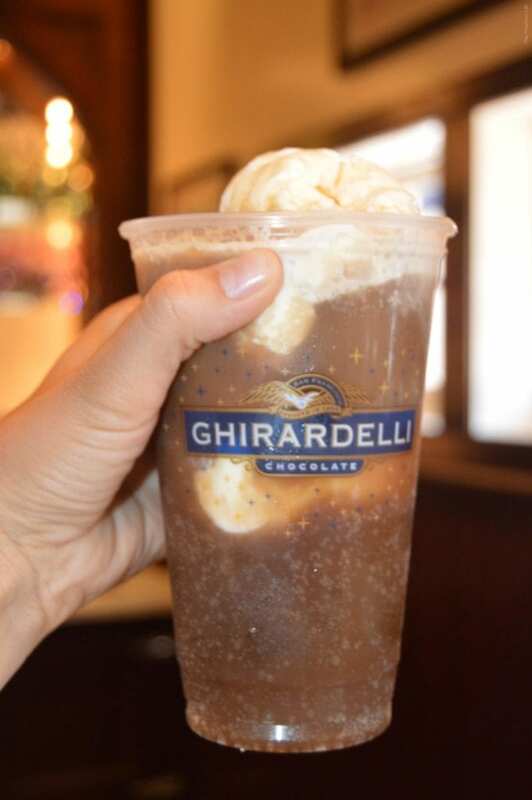 We visited the Ghirardelli store more times than anyone should in a week but the chocolate and treats were so delicious that we couldn’t help ourselves! We were provided with an allergen list upon arrival to help us understand what we could safely enjoy. Most things were gluten-free which was nice. While they do make one chocolate bar or two that contains gluten, they thoroughly clean their lines before producing the products that are gluten-free. 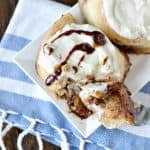 We thoroughly enjoyed the root beer floats as well as banana splits. 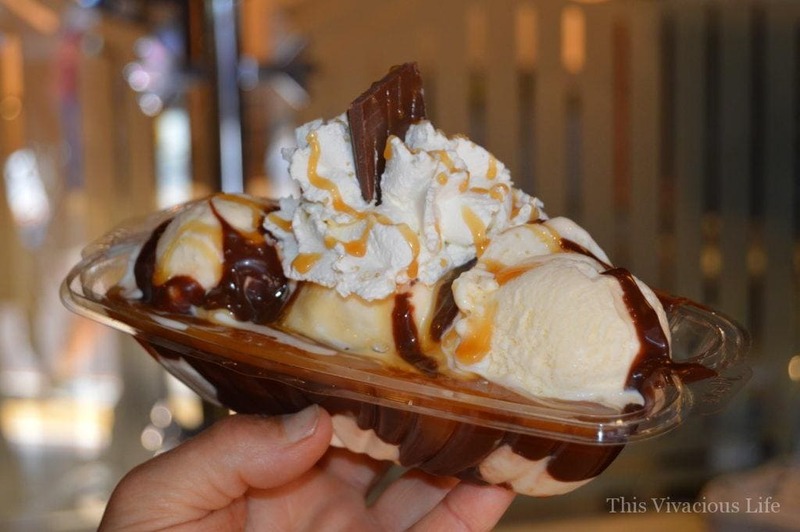 The banana splits are big enough to share. We were honored to be see and share some of the allergy-friendly menus. This new menu at Blue Bayou was one of them. 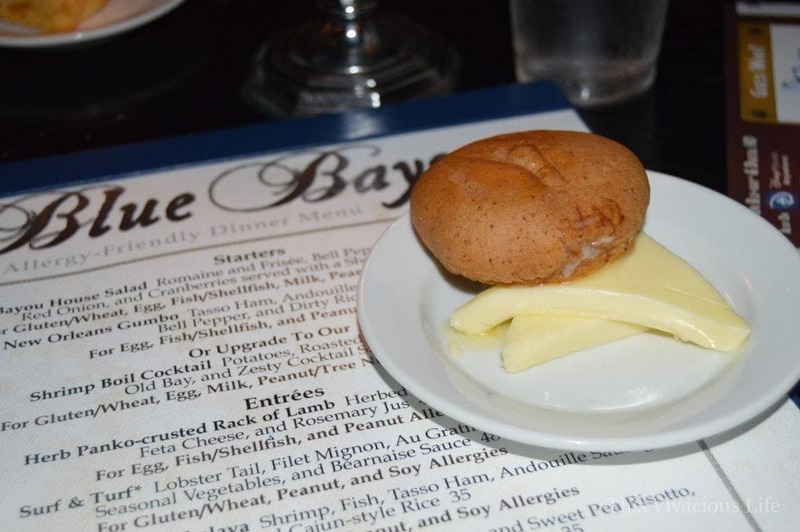 Some of you may remember that Blue Bayou was our favorite dining experience on our last Disneyland gluten-free & California Adventure gluten-free trip. This was in large part due to the gluten-free crab cakes and famous Blue Bayou potatoes the chef made especially for us. Unfortunately they no longer have crab cakes and have changed their potato recipe. This was a huge disappointment to us. 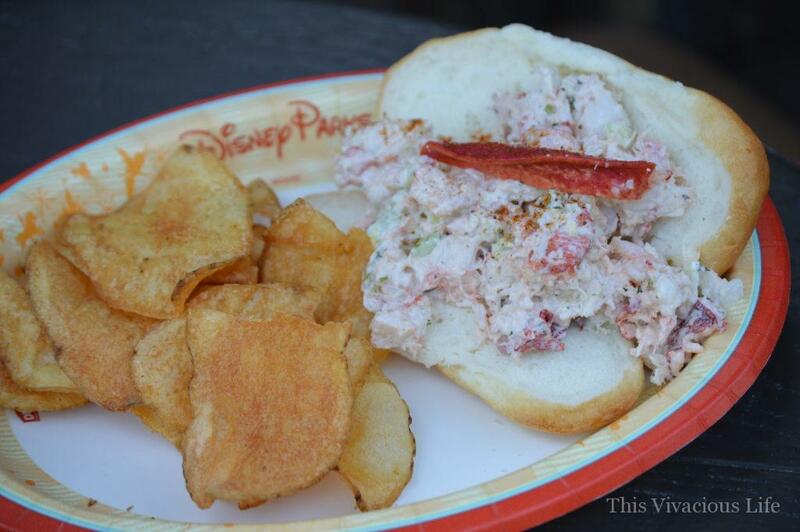 We started with warm gluten-free rolls and the Blue Bayou house salad. Both were very good. I especially liked the salad. 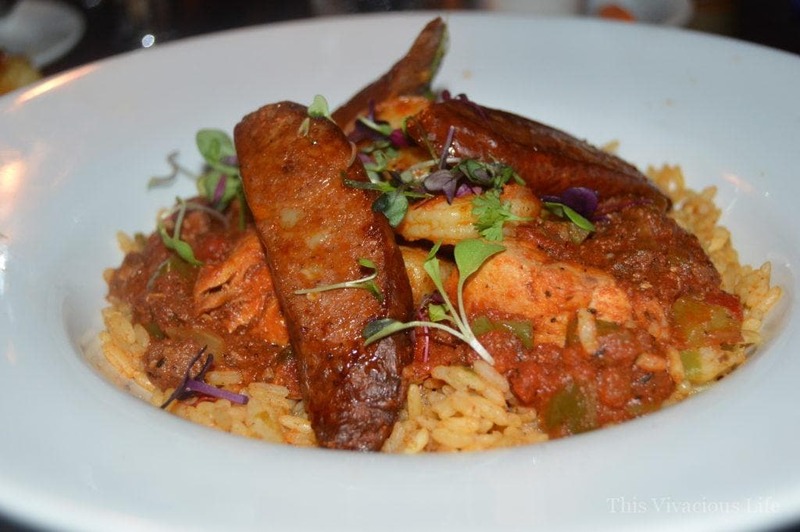 My mom chose the Surf and Turf while I opted for the Royal Street Seafood Jambalaya for our main course. Both were again, very tasty but not outstanding like on our last visit. They brought us out the new Blue Bayou potatoes to try and sadly they weren’t something I would order again. The ones on our last visit were creamy and unique. They were full of flavor and almost addicting. These were more dry and really had no distinct flavor other than potato with a touch of cheese. 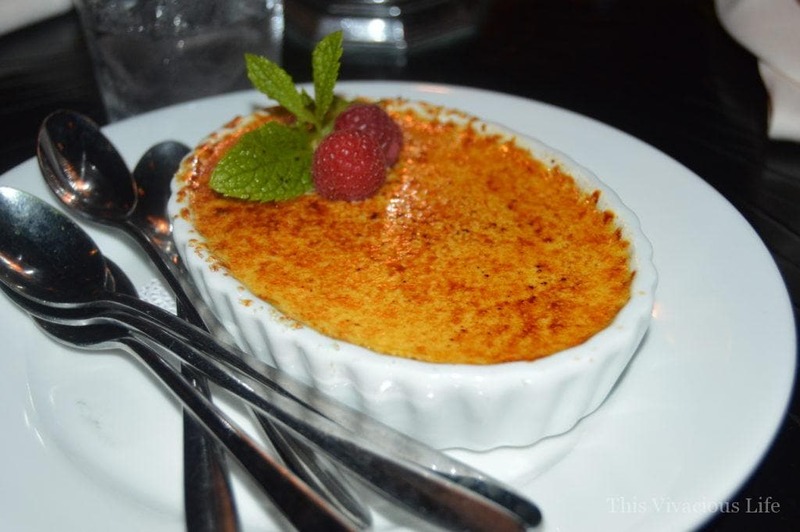 We finished off our meal with creme brulee. It was very good and was a nice sharing size portion. The cost of dinner here is quite a lot but the service was impeccable. Our servers were fun and very kind. They brought my boys their water with a fun light up cube that made it an exciting drink. 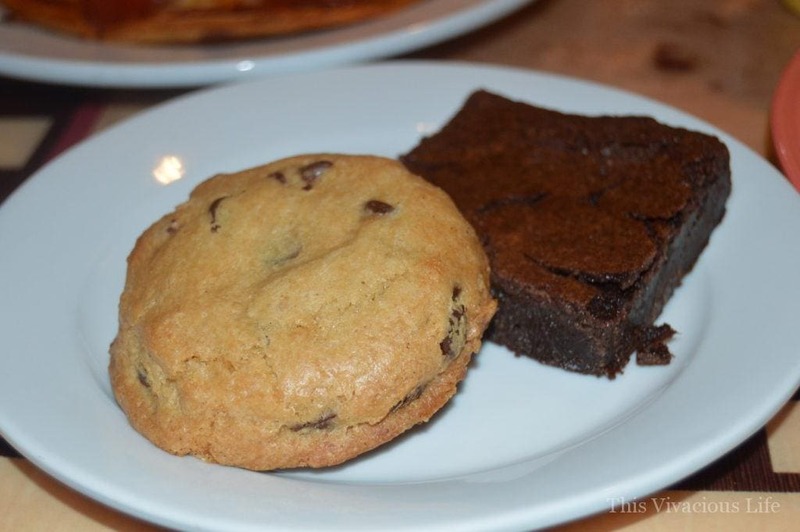 Are there gluten-free character Disney dining experiences? Yes and I highly recommend them! When doing gluten-free Disneyland & California Adventure, Goofy’s Kitchen is a must. We always choose one character dining experience for our little ones and I am glad we do. They always love it and it becomes such a fun memory for everyone. 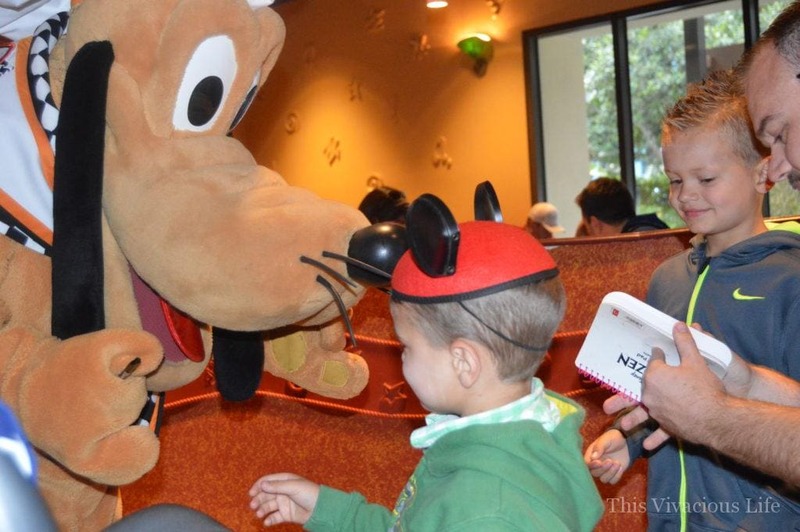 These character dining experiences allow them to get more one-on-one time with characters. It also helps them get autographs for their books without waiting in line after line. As a mom, I say that the additional cost of this meal was worth my time saved not standing in as many character lines. Goofy’s Kitchen is just that, goofy! 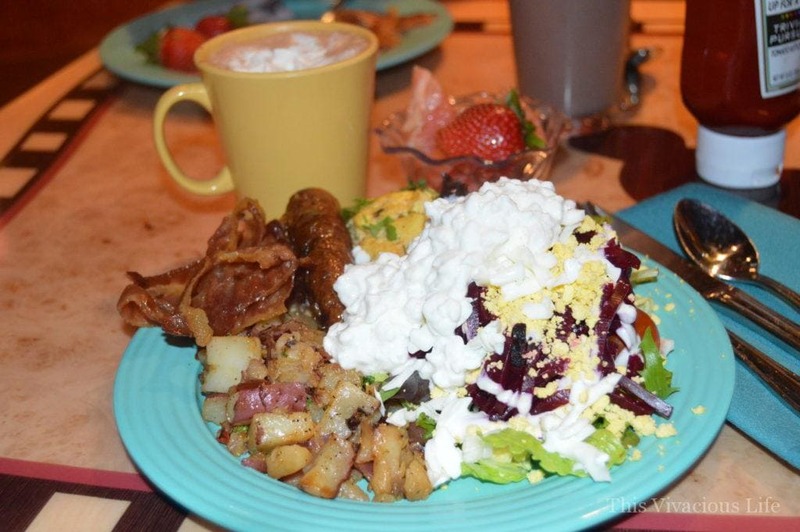 All the food is totally kid friendly and a fun way to start the day. 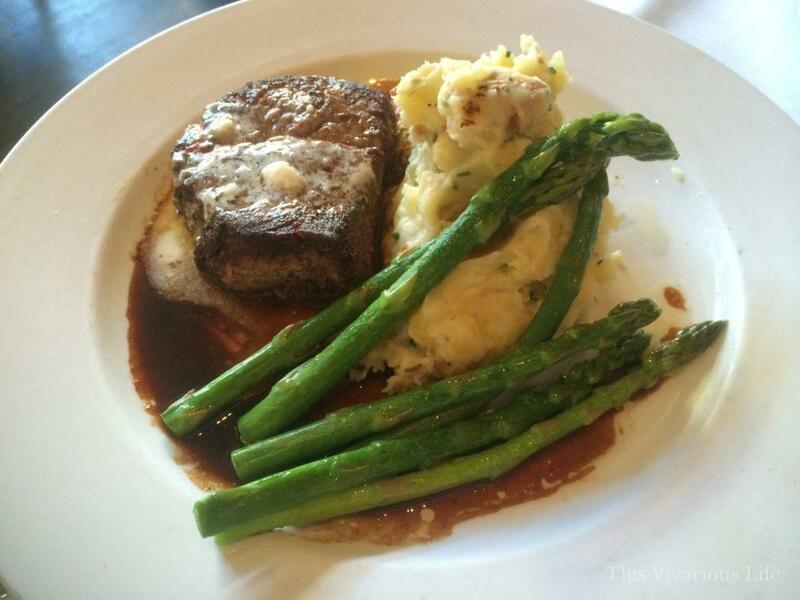 The executive chef is very helpful in navigating what we could enjoy gluten-free. He let us know that he could make us anything we wanted in the back because most of the buffet items could be a cross-contamination risk. For example, the bacon is placed on bread to soak up the grease. Scary! Don’t fret though, they will make you fresh bacon in the back and bring it right out to your table. I personally love salad so I also enjoyed a fresh green salad with my breakfast. The chef made my mom and I our own gluten-free pepperoni pizza, eggs Benedict (minus the English muffin) and plate of warm chocolate chip cookies and brownies. The pizza was awesome! 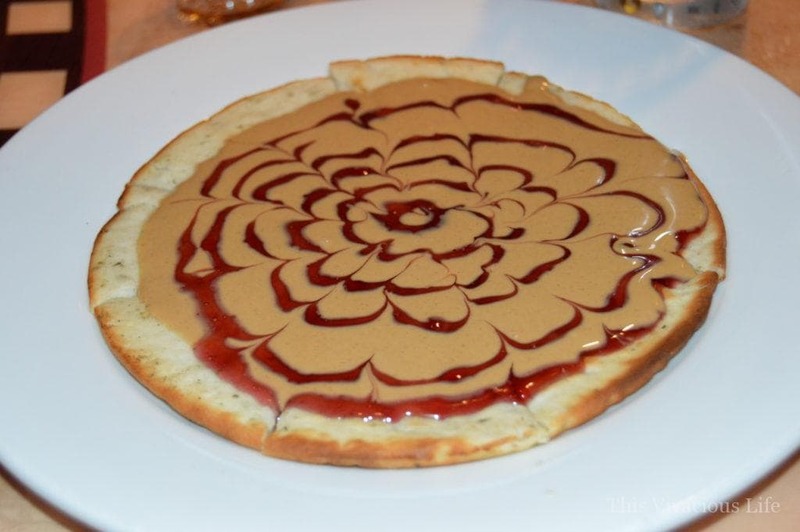 The crust was filled with tasty herbs which I didn’t think about when I ordered the famous PB&J pizza gluten-free. It was not as good with a savory crust. 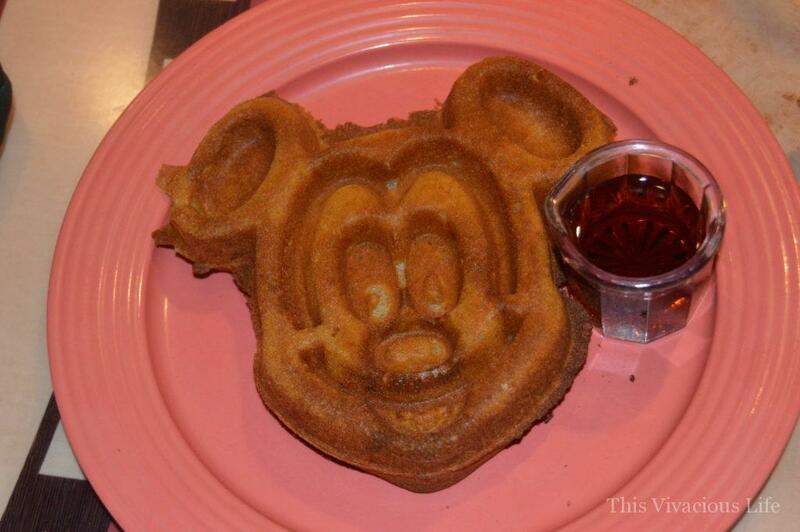 The Mickey waffle was divine! In fact, my dad said it was much better than the regular gluten-filled waffles. It was crispy on the outside and soft in the center. It was very big so I only recommend one if you are really hungry. 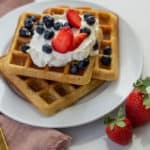 It is made in a dedicated gluten-free waffle iron and is created using Bob’s Red Mill gluten-free flour. 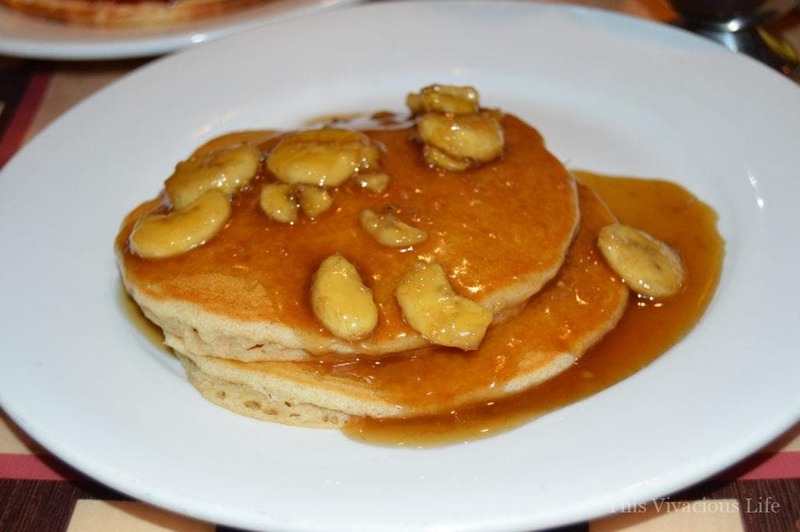 Lastly, I couldn’t resist the urge to have them make me the gluten-free pancakes banana foster. OH MY GOODNESS, they were the best! I had already eaten everything else so was thinking I might be able to eat a few bites but no, I had to eat the whole plate. 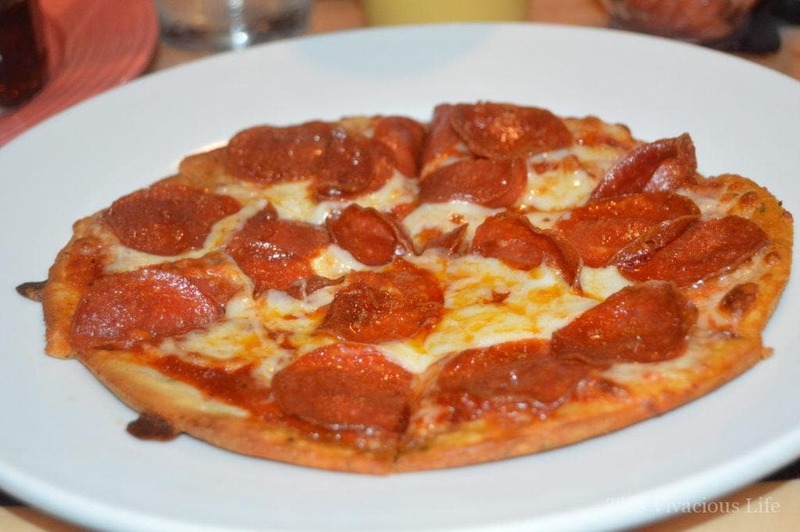 Where do you eat gluten-free in Downtown Disney? In addition to the yummy food above, we also enjoyed a very tasty meal at Ralph Brennan’s Jazz Kitchen in Downtown Disney. The ambiance was so fun. It is reminiscent of what you would expect old New Orleans to be. With a live band dressed in old time jazz wear and playing the blues, it made for a fun dinner. The steak was very delicious and seasoned to perfection. 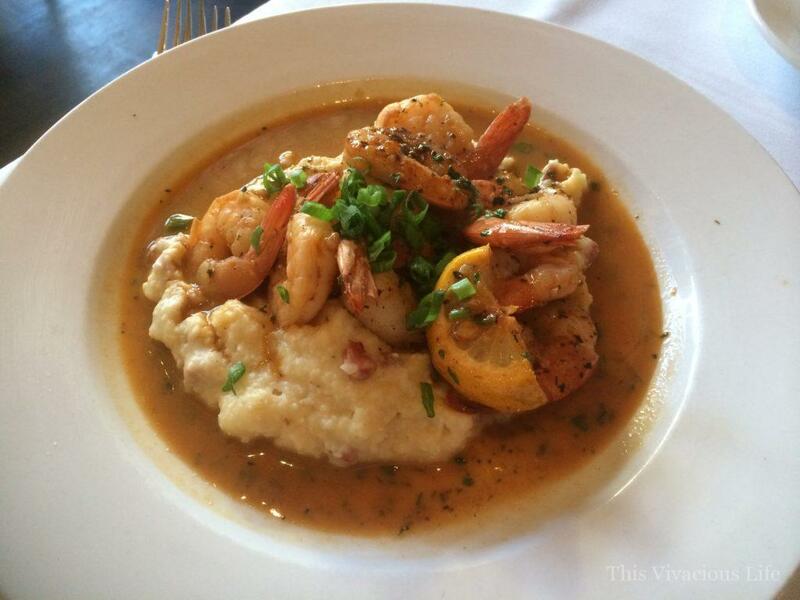 The shrimp and grits were SO good! I literally wanted to lick my plate clean. My family and I really enjoyed this dinner and recommend it for anyone but especially those who like a little creole in their life! I first wrote about our Disneyland trip ten years ago when it was virtually the only amusement park with good gluten-free food. We also did Disneyworld gluten-free which was fantastic! We had a wonderful time and I can’t imagine a more magical 30th birthday celebration with the people I love most than this Disney vacation! 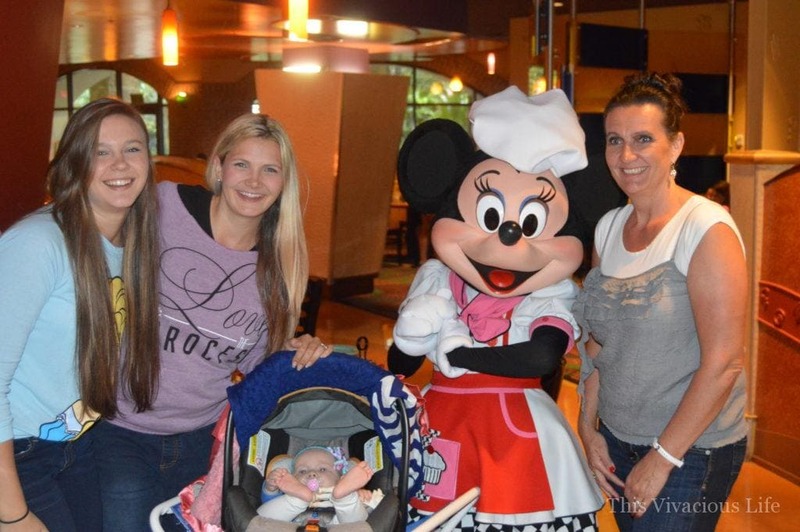 My friend Chrystal from Gluten-Free Palate also went to Disneyland and enjoyed gluten-free food. Be sure to check out what she enjoyed. *I was provided with two one-day park hopper passes as a member of the media. We still bought the other 4 days we were there as well as our kids passes so rest assured that none of my reviews are biased. I loved the time we had in the park and all reviews are my own and 100% unbiased. I take no responsibility for the dining experience of others while at any of these restaurants. Always be your own advocate and ask lots of questions to ensure a safe dining experience. Heading to DL between Christmas and New Year and I am hoping beyond hope that my husband and I will be able to find food readily available so that we may avoid becoming HANGRY :):):) and I will call ahead as you suggested to facilitate a great visit. I’m just a little concerned that your results are not what the “average joe” should. Other than calling ahead do you have any tips that may make our visit yummy. We are a party of 7 and 2 of us eat gluten free. Ahh!! Thank you so much for this post! we are planning our second trip to Disneyland and this has given me sooo many more tasty GF things to try. Can’t wait!! Thank you for this wonderful post! 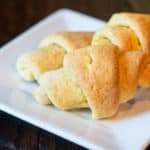 My family is going to Disneyland in November and it’s been a while since I went and I was curious what they offered now for gluten-free (especially now that it’s become much more mainstream)! I’m so excited and will definitely be planning ahead at some restaurants. My soon to be 1 year old is gluten free as well so I especially wanted to make sure he had options! I couldn’t help but notice you mentioned they removed the gluten free crab cakes! If you’re ever in the Los Angeles region, I own a casual fine dining restaurant named Aroha and our entire dinner menu is gluten-free, including our crab cakes. One of the perks of marrying a chef… He had to learn how to accommodate my list of allergies, and therefore, everyone else’s!! Oh my goodness Justine, I love this! I am coming to Expo West at the Anaheim convention center in March and would LOVE to come visit you and share my experience! How far are you from the Anaheim convention center? 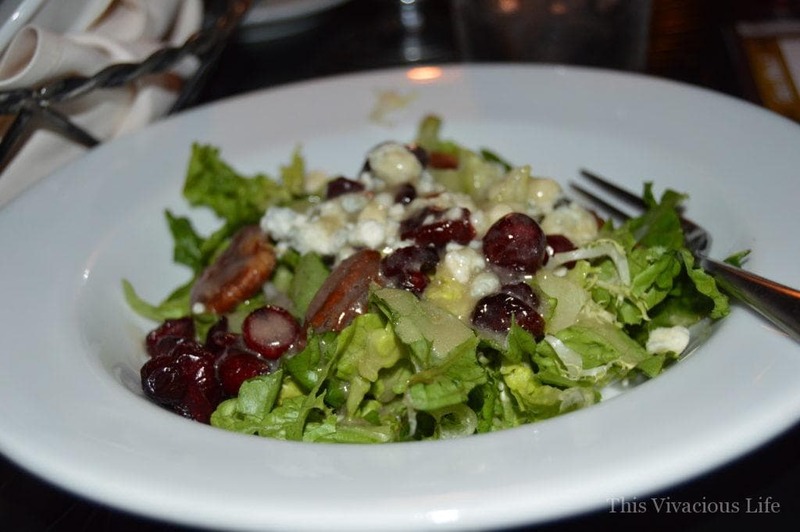 I just know you will love Disney dining as much as we did! The biggest thing to remember is PLAN and call ahead. We got all that we wanted because I called more than 72 hours in advance and requested it. They really are very accommodating when people ask in enough time for them to make it happen. Can’t wait to hear all about your trip! Please email me anytime, glutenfreefrenzy@gmail.com. Hi Chandice! Our restaurant is about an hour and forty minutes north-west of Anaheim. A bit of a treck but it would be wonderful if you were able to come in! If you do, please let me know in advance. At this point, my husband is the one there and I’m normally at home with our son. My husband is from New Zealand and was very shocked that flour was added to so many sauces, soups, and recipes out here! He was never taught to add fillers like that, so making a fully gluten free menu for everyone was very easy for him! He even picks up gluten-free bread every week to make homemade croutons for our gluten free guests salads! 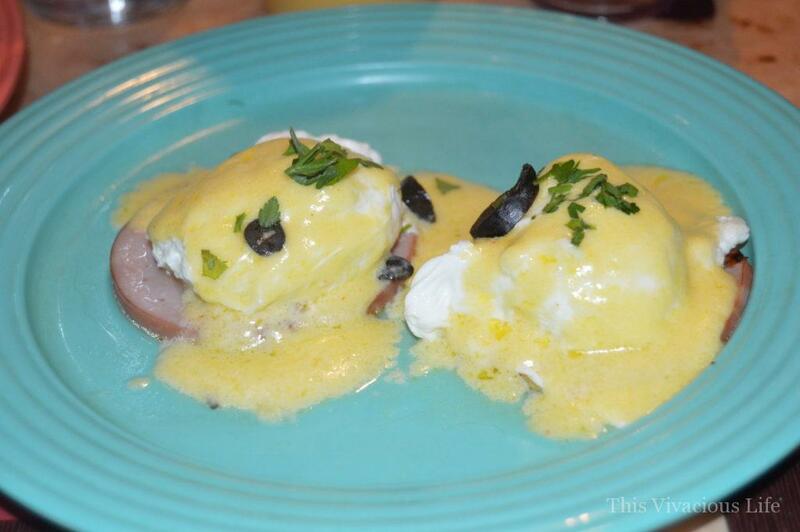 Our entire Sunday brunch menu is gluten free as well. We’re probably the one restaurant that when I guest lists an allergy on a reservation, we get excited because we know they’ll have a great time! I will definitely make sure to make reservations at the restaurants in advance and call a few days to a week before about our orders! We are travelling to Disneyland on Saturday but unfortunately it looks like your restaurant is just a bit too far away from where we’re staying (right near Disneyland). Hope you have a great trip to Disneyland in Nov 🙂 All the best, Emma. My husband was born and raised in Auckland…he was a chef at the Stamford Plaza (Kabuki restaurant) when I vacationed there 7 years ago and the rest is history!! It’s definitely a treck from Anaheim but if you’re ever in California again, definitely stop by! We’ve had people drive from San Diego and fly from New York just to dine at the restaurant! Saturday is actually our restaurant’s two year anniversary so we’ve got some special things going on!! Thanks for a great preview as I prepare to go to Disneyland. I live by Walt Disney World, so I’m hoping I have similar great experiences in Cali soon. 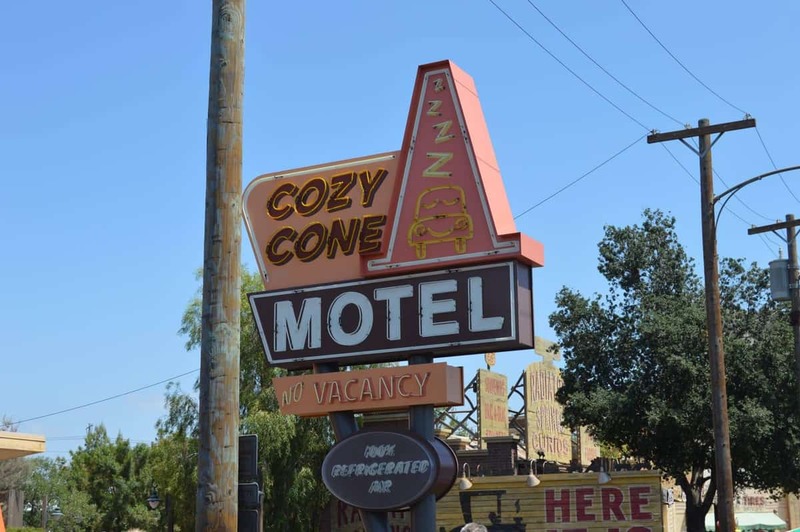 You mentioned the Cozy Cones. Any idea if the flavored popcorn is gluten free? An email to Disneyland special diets was answered with a generic reply. Thanks! Great post! Hey Cassi, I hope it is as wonderful for you as it was for us. The key is to call more than 72 hours in advance to each restaurant with your requests. As far as the flavored popcorn, I was told it was but we sticked to basic just in case. I am SO happy to hear this! I loved celebrating 30 there and the food was fantastic! The key truly is plan, ask, plan and ask some more. 🙂 Happy early birthday and please tag me on social media with pictures. I am dying to see how everything turns out for you! 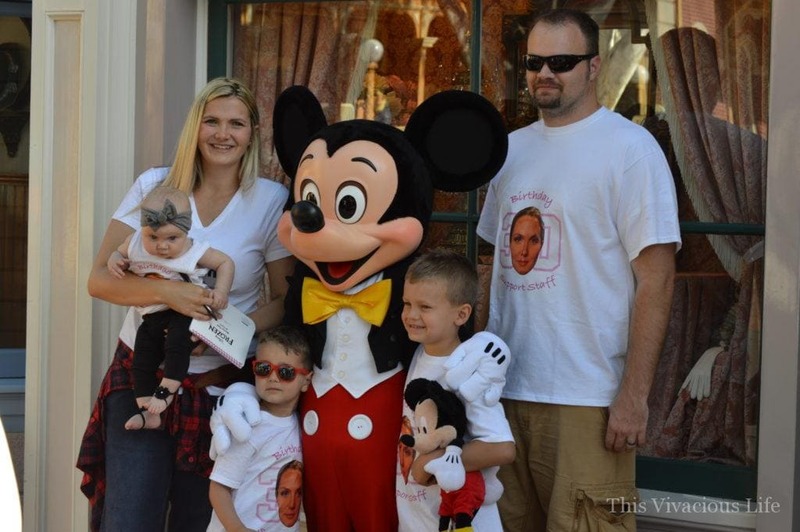 I just got back from my Disneyland birthday celebration and wanted to provide this update for your readers, because I hadn’t seen any blogger post this yet! I contacted Disney in July prior to my visit, and was told to go to City Hall and get a list of all the allergy-free items offered in the parks, and that all restaurants would have an allergy-friendly menu to look at. (Note: I have found at least one place online where somebody posted an old copy of this list) Luckily, I did a lot of internet research to know pre-plan where we wanted to go. 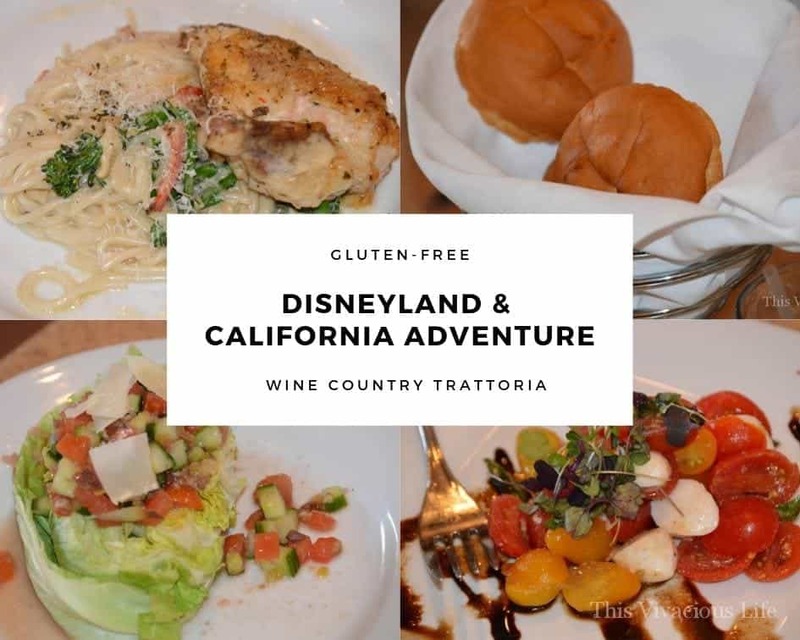 When I showed up at the park, I was told at Disneyland and DCA that that list no longer exists – I don’t know when it went away but between July and now – and guests have to go to each restaurant in person to request their allergy-friendly menu. While the allergy menus are great and I”m so glad they have so many options, guests have to go to each restaurant individually, which is so inconvenient to have to do on vacation. As of right now, Disney doesn’t make these available online, but all their regular menus are……..unfair for those with allergies. if I hadn’t done lots of planning from home (Googling the menus that other people posted online), it would have really frustrated me and wasted a lot of time just checking out menus. I realize not everybody cares that much about food, but it was special celebration and I wanted to make sure to pick the places I liked the best! 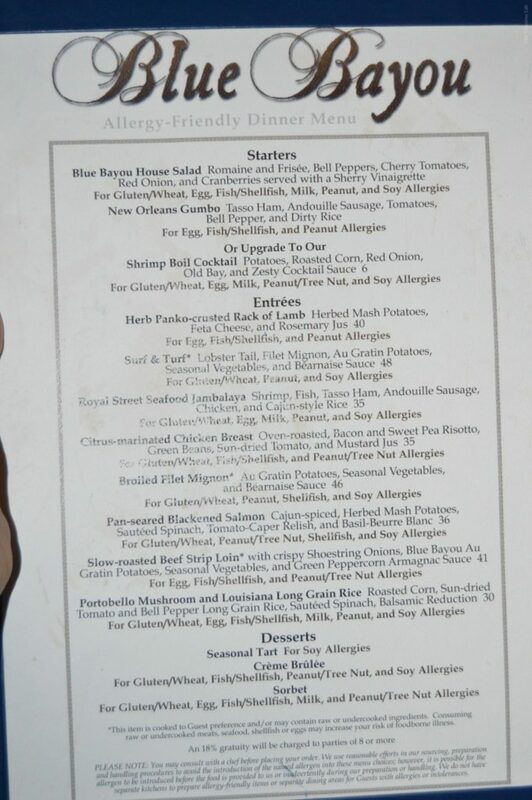 I’m going to contact Disney and ask that they make their menus more accessible and bring back the allergy list so guests can see all items in one comprehensive document. I live near Disneyland and usually pack my own food when I go there because I hate the humiliation of having to always make special requests/beg them to heat me up a frozen gf pizza/delay my whole group while I talk to a manager to find out if there’s anything at all I can possibly eat. I can’t understand why Disney World is the most gluten free friendly place on planet earth and Disneyland makes no effort to accommodate gluten free guests. From reading your blog, it sounds like they’re finally going to at least get some special menus. I’d really love it if they just marked “gf available” on some of their regular menu boards so I’d make everyone less irritated with me when it’s time to eat. I have a season pass, but I get so upset at the thought of trying to eat at the park, I’ve only used it twice this year. How were you able to email Cafe Orleans ahead? I spoke with the resort special diets chef and the marketing department both of whom helped me tremendously with the individual restaurants we wanted to dine at. I am glad to hear you had a great experience with meals at Disney. 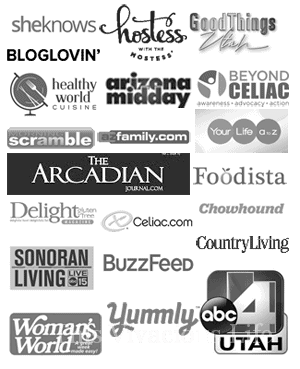 I think it would be good for your readers to know that your experience with gluten-free options are not typical, however. 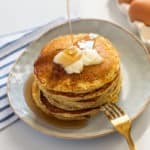 Yes, the chef will come out and talk to you about what you can eat on a buffet but the rest of us don’t get specially made peanut butter pizzas at breakfast or gluten-free pancakes or any of the other things you had made for you. 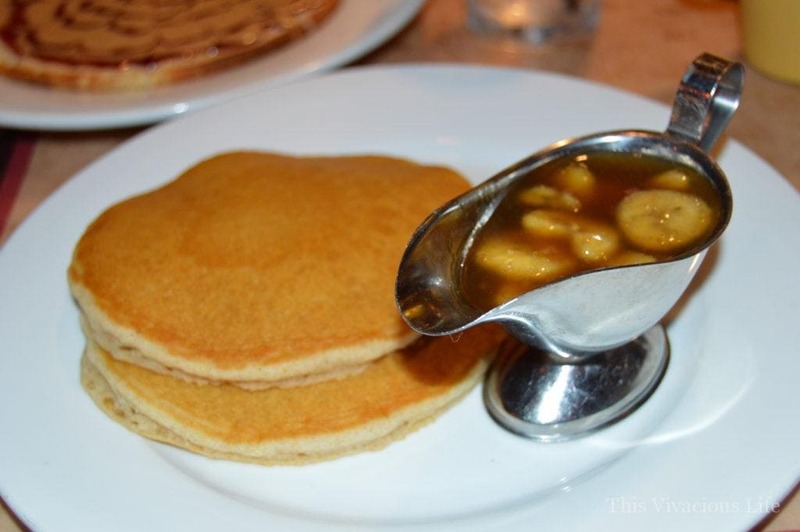 I definitely think you could have these things made for you if you asked the chef to make them. Also, did you call ahead (more then 72 hrs.) and speak to the special diets department? They are very willing to help make your experience just as great as this was for us with a bit of planning and preparation. Most didn’t care that I was a blogger. They just wanted to make the experience great.